It’s unacceptable that 1 out of 3 children experience bullying. That 9 out of 10 LGBT students are harassed, at school and online. That 20% of high school students seriously consider suicide—and some follow through. This epidemic must be stopped. Your donation will fund empowerment events and workshops for under-resourced youth. You’ll also support our We Care program that provides empowerment packages for kids who are suffering and at risk. Donate to take a stand — for a braver, kinder and safer world for ALL. Kindness is contagious. Create your very own custom fundraiser. You have the power to create change. Support our initiatives by shopping through Amazon Smile. It’s an easy way to give back with no extra cost to you! 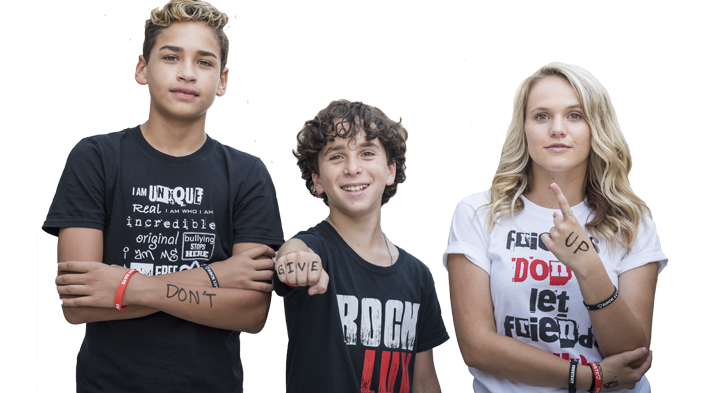 Take a quick survey, choose Free2Luv, and stand up to bullying. Who knew giving back could be that easy! Your employer may match your donation to help us empower youth. Please ask them! We’d love to be considered. I love how you use film to discuss topics such as ‘coming out’. Piece of Cake was so beautifully done and I’m sure it helped so many come out and share their authentic selves with family and friends. It’s really great to know there is a safe space where LGBT kids can feel a part of something and feel supported. Thanks for being a safe haven for the LGBT community – we need you, Free2Luv! Free2Luv is an amazing organization that truly operates from the heart. Their mission is a powerful & oh-so important one (actually, more like crucial in this day and age), and their people are dedicated, passionate, creative, kind, compassionate and professional. I’ve partnered up with them and donate a percentage of my (business) sales to them, and every interaction has been an absolute joy. It is a pleasure and an honor to be involved with this incredible non-profit. THANK YOU Free2Luv for your wonderful work! Ultimately, we all benefit from it. I joined @free_2_luv last year because I struggled with self-confidence due to the many negative labels given to me. The most commonly used words were nerd, fat, ugly, untalented and annoying. Truth is, I still struggle, but I am lucky to have my family and friends. I know not everyone is as lucky to have that support system, so I wanted to help others. Becoming a youth advocate for Free2Luv was fate! It fell into my lap when I was trying to find my smile again and help others. I am still working on my self-confidence and really struggle making friends but I am feeling blessed more and more every day. As a single mother of a teenage daughter, it’s so vital to me that my daughter feels empowered and I found that this organization does just that. They stress the importance of being true to yourself and staying strong in your beliefs and convictions and not falling victim to peer pressure. My daughter had the privilege of participating in one of their empowerment workshops and it was a really powerful experience for her. I love Free2Luv and what they stand for and hope that every teen can be touched by this movement. We look forward to getting more involved! Anytime… It is hard to find people like you out there. We think we are living in a paradise but the reality is much darker. There are a lot of people that don’t like bullying and other kinds of abuse… But very few take action to do something about it. Where i live bullying is not such a big deal… even if it is very mild.. . ( more like jokes that all people laugh at even the “victims” . But there are some that go a little bit far and damage a lot of people mentally… Scars that are so hard to remove later on in life… That is why i salute you!!! And you have my full support in the cause! And i hope one day i will see a bully free world and all kids treated equally but until that day even 1 kid saved by this movement is a win.